Joseph Yoon was born and raised in Fairfax, Virginia. He is extremely knowledgeable of the Northern Virginia area, including the people and places in it. He is fluent in Korean and speaks some Spanish. He is a 4th Degree black-belt Taekwondo Master and an outdoorsman. 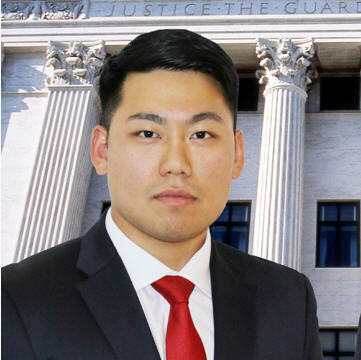 Joseph stands out as a defense attorney because he is an insider and can relate to his clients thanks to his diverse background, modest lifestyle, and the difficulties he’s experienced in overcoming financial challenges throughout his life. He is committed to reaching an optimal resolution to your case to minimize the possible harm to you and your family. Having worked hard to become a lawyer despite the odds, he knows how a criminal or traffic conviction may affect your life. He understands that most of his clients are good people who made a mistake and take it very hard on themselves for landing in a situation that could lead to jail. Joseph currently serves as a Sergeant in the United States Army Reserve. He is physically and mentally fit, an expert with small arms and rifles, and dedicated to serving his country. If you are in the military, you know that Uniform Code of Military Justice (UCMJ) applies to you if you are charged in the civilian world. You need a defense lawyer who knows the reprimand and possible separation that can occur if you are convicted. Joseph has handled over 1,600 traffic and criminal cases as a defense lawyer and has produced excellent outcomes that have led to second chances for hundreds of clients. All cases are different, and no two clients are identical. You can rest assured that Joseph will build and craft a strategic defense tailored to your needs and plan to help you through your legal trouble. If you are involved in a car accident and were injured, Joseph can help with that too. As a personal injury lawyer, he will do all that is possible to negotiate the highest settlement for your case, and if necessary, file a lawsuit and fight in the courtroom to obtain a favorable judgment for you.